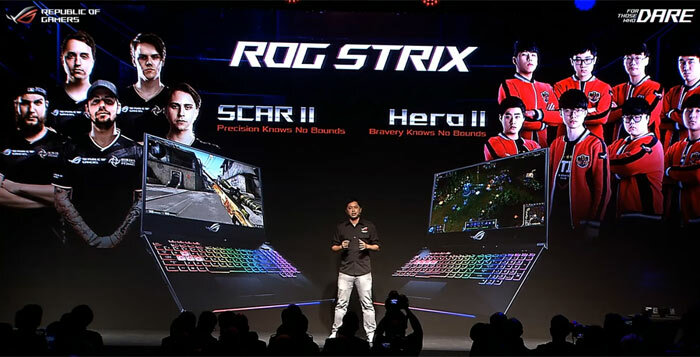 Asus Republic of Gamers has launched the new Strix GL504 gaming laptop in two flavours; the ROG Strix Scar II for FPS fans, and the ROG Strix Hero II for MOBA players. Sharing the same base model number, these 15.6-inch form factor machines only differ by the display panel, GPU options, and finishing details. Probably the most striking change delivered to the RoG Strix GL504 design is via the minimal bezel display now equipped in all models. If you look back at the previous GL503 you will immediately see the difference. Though the top and side bezels are indeed slim the bottom one is rather chunky - but Asus has made a feature out of it with a substantial ROG logo and placing the webcam and microphones there. The slimmer bezels might have stolen the headline but that isn't the end of the impressive new display properties; users have the choice to buy the Scar II with an 100 per cent sRGB FHD IPS panel sporting 144Hz refresh rate with 3ms GtG response time. Meanwhile if you opt for the Hero II there is that same choice or a 60Hz version if you don't need the super-fast refresh panel. On the closely related matter of graphics processors, you can specify an Nvidia GeForce GTX 1070 8GB (GL504GM) or GeForce GTX 1060 6GB (GL504GS) with the Scar II but the MOBA-targeted Hero II tops out at a GTX 1060 6GB. Whichever design you choose the rest of the variable specs are as follows; choice of 8th Gen 6C/12T Intel Core i7-8750H or 4C/8T Core i5-8300H processor, up to 32GB of 2666MHz DDR4 RAM, storage choices from M.2 NVMe PCIe 128GB / 256GB / 512GB SSD, 2.5-inch 5400rpm 1TB SSHD, 2.5-inch 5400rpm / 7200rpm 1TB HDD. Keeping the above performance components cool is the new Asus HyperCool Pro system. These machines feature include heatpipes and metal heatspreaders covering the CPU, GPU and graphics memory and VRMs. The GTX 1070 equipped models have extra heatpipes, Asus says. Asus has pre configured multiple fan profiles (overboost, silent etc) to control the dual blowers powering the cooling system. All models come with 802.11ac 2x2 Wave 2 Wi-Fi Bluetooth 5.0, 2 x speakers with smart-amplifier technology, Array microphone, 1 x USB 3.1 Gen 2 Type-C, 2 x USB 3.1 Gen 1, 1 x USB 3.1 Gen 2, 1 x mini DisplayPort 1.2, 1 x HDMI 2.0, 1 x RJ-45 jack, 1 x SD card reader, 1 x 3.5-mm audio combo ports, Windows 10 Home / Pro, and weigh 36.1 x 26.2 x 2.61 cm. These machines weigh in at 2.4kg. Despite their compact footprints the new laptops feature full sized keyboards with numpads. Asus has RGB LED enhanced the keyboards (Aura Sync compatible) and they are built to last - with a lifespan of 20 million key presses. Other attractive features of the keyboard are its 1.8 mm of key travel, overstroke technology (with raised actuation point), and four dedicated hotkeys configurable in the ROG Gaming Center application. If you like the look of these laptops you will be able to snag the Scar II from $1999, while the Hero II starts at a more reasonable $1699.